Colony residents stated that whenever it rained, water collected up to a depth of two feet under the bridge and stagnated for days. Residents of Malkajgiri protest against poor condition of the road at RK Nagar on Sunday. 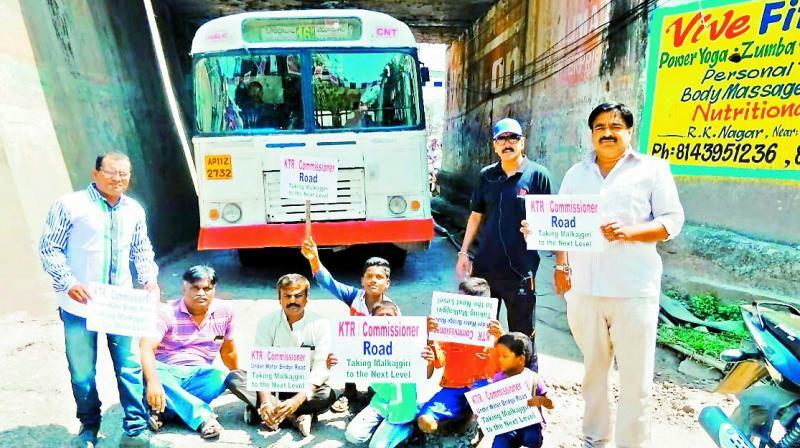 Hyderabad: Residents of Malkajgiri staged a protest to highlight the poor condition of the road at RK Nagar on Sunday. In keeping with the nature of protests taken up by residents of other areas, the Malkajgiri residents named th road under bridge at RK. Nagar as ‘KTR/Commissioner bridge’ and said they would not pay taxes till the time the road was fixed. Colony residents stated that whenever it rained, water collected up to a depth of two feet under the bridge and stagnated for days. “It becomes difficult to use the because of that, a resident said. The residents alleged that motorists underwent a difficult time while negotiating the stretch. They said that though they had given representations to the GHMC authorities concerned in the past, nothing materialised on the ground because the officials ignored them. Some declared that they would not going to pay local taxes till the time the road was fixed.